The winner of our spring At Large contest is this photo of small craft off the Stone Town district of Zanzibar, an island off the coast of Tanzania. The photo is featured in the Spring 2017 issue of Research|Penn State magazine, which arrives on campus soon. 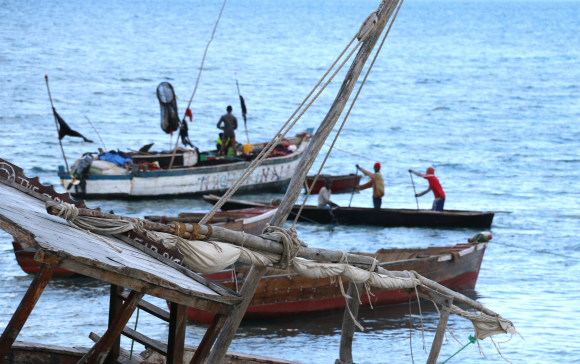 For hundreds of years, similar boats carried on extensive trade among ports from India to Oman and Yemen in the Middle East and along the Swahili coast of East Africa. Janet Purdy, a doctoral candidate in History of Art and Architecture, took this shot when she visited Stone Town in 2016 to study the trade routes and the massive, elaborately carved doors commissioned by wealthy Omani merchants who lived there in the 19th century. Zanzibar was a thriving cultural crossroads where people, goods, languages, religions, and artistic practices met and blended. The doors, bearing symbols and decorative elements from many sources, were so important as the public “face” of their owners that they were often the first part of a new building to be made. Thank you to all who sent images for consideration. We now announce the contest to find another superb image for the At Large pages of our Fall 2017 issue. In addition to publication in Research|Penn State, the winner will receive a high-quality print of the At Large spread, suitable for framing. Deadline for submission is Friday, June 30, 2017. Image must be available at high resolution, at least 300 dpi (this is not the same as ppi) at a size of 11” x 17”. Keep this in mind as you shoot photos, especially through microscopes. We have had to eliminate beautiful images from consideration because they were not shot at a high enough resolution to be enlarged to publication size. Image can be a scenic, close-up, or micrograph. It can be realistic or abstract, color or black & white or colorized. Archival shots will also be considered. Previous winners can be seen here, here, here, and here. Although we may use a shot with a person (or people) in it, we do not use portraits. Please send your photos to me, Cherie Winner, at clw43@psu.edu. Lo-res versions are fine at this stage. If we select your image, we’ll ask for the hi-res version. For more information, drop me a line via email or call me at 3-4750.